If you are prescribed sildenafil for your pulmonary hypertension, always be sure to read your doctor’s instructions. Sildenafil comes in tablet, liquid oral suspension, and IV drip form. Sildenafil tablets for pulmonary hypertension are available in 5 mg or, much more commonly, 20 mg doses per tablets. Take one tablet with water three times a day, 4 to 6 hours apart. Liquid oral suspension sildenafil is also available in 5 mg or 20 mg doses. Each bottle of liquid suspension will be labeled with how many mg of sildenafil is in each mL. The oral suspension will have been freshly mixed by your pharmacist, but you should still shake the bottle for ten seconds before opening. Use the dosing syringe provided by your pharmacist to measure out your prescribed dosage by fitting the included plastic adapter to the bottle, tipping it upside down, and pulling out the syringe’s plunger to the correct amount. Turn the bottle right side up, detach the syringe, squirt the solution into your mouth, and swallow. Like the tablets, oral suspension sildenafil should be taken three times a day, 4 to 6 hours apart. Be sure to store your oral suspension in the refrigerator, and never use an oral suspension past its expiration date. Intravenous sildenafil is typically reserved for those who have been taking sildenafil daily but are temporarily unable to swallow the oral medication. It comes in doses of 2.5 mg and 10 mg, since intravenous sildenafil is roughly twice as effective as oral sildenafil. You should be given this injection three times a day as an IV bolus. If you forget to take a dose of sildenafil, take it as soon as you remember; however, you should never increase your dosage to make up for a missed dose. There is no increased benefit above the maximum dosage of 20 mg, so never take more than 20 mg at once. Sildenafil can be taken with or without food, though you shouldn’t eat grapefruit or drink grapefruit juice while on this medicine, as grapefruit contains a substance that worsens sildenafil’s side effects. You shouldn’t drink alcohol while on sildenafil; alcoholic beverages can reduce the drug’s effects. Whenever you get a new supply of sildenafil tablets, always double-check to make sure they’re the correct kind. Sildenafil is used in the treatment of other conditions, but at a higher dosage than you’ve likely been prescribed. Go to your doctor regularly while taking sildenafil for pulmonary hypertension. Never stop taking sildenafil for your condition unless your doctor tells you to. If your doctor decides to switch your medications, you may be given gradually decreasing doses of sildenafil, as stopping suddenly can cause problems. If you have kidney or liver problems, speak to your doctor before starting a sildenafil product. The use of sildenafil in children is still under review, but you and your doctor may decide the results so far look promising enough to try it. Children will typically be prescribed a dose of 10 mg to 20 mg every 4 to 6 hours. Always follow your doctor’s directions closely, though they shouldn’t differ much from the adult dosing instructions, if at all. Sildenafil may be useful in situations where other treatment options are unavailable, but their effectiveness in newborns is still being tested. Nonetheless, your doctor may prescribe sildenafil for your infant. The neonatal dose ranges from 0.5 mg to 1 mg for newborns, spaced 4 to 6 hours apart. Be sure to always follow your doctor’s directions. PDE5 is an enzyme that breaks down another substance called cyclic GMP. Cyclic GMP allows your blood vessels to relax and widen, and PDE5, by reducing your cyclic GMP levels, tightens blood vessels and restricts blood flow. Sildenafil citrate is a PDE5 inhibitor. It blocks the effects of PDE5, which in turn increases the amount of cyclic GMP in your body. Your blood vessels widen, more blood can flow through them, and your blood pressure becomes more manageable. Pulmonary hypertension, left untreated, restricts blood flow to your lungs. Can Viagra Be Used to Treat Pulmonary Hypertension? Technically, yes. Viagra’s active ingredient is sildenafil citrate–the very same medicine you will have been prescribed for your pulmonary hypertension. The bad news is that Viagra tablets come in doses of 25 mg, 50 mg, and 100 mg, all of which are higher than the maximum prescribed dose of 20 mg for pulmonary hypertension. The good news is that Viagra tablets can be cut and crushed. 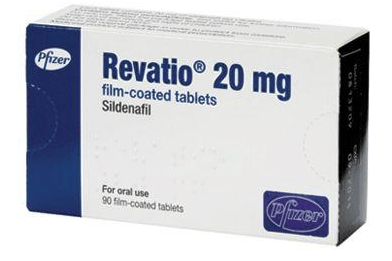 20 mg sildenafil tablets are easily found online at a wide range of prices, both as generics and as brand-name Revatio. Generic 20 mg sildenafil tablets can cost as little as $15 or less for 30 tablets, but a 90-pill supply of Revatio can set you back as much as $4000. Be careful when shopping online. When searching online pharmacies for sildenafil, you will undoubtedly find Viagra and its generic versions. While you can still use Viagra to treat your pulmonary hypertension, you’ll have to cut or crush the pill to measure the correct dosage, and it will be more expensive than 20 mg tablets. The cheapest generics will run you $0.60 per pill. Brand-name Viagra can cost over $3 per pill, to nearly $800 for a supply of 88 pills. Oral suspensions are next to impossible to find online; the closest you’ll find easily are gel packets intended for the treatment of erectile dysfunction, costing about $75 for a pack of ten. You cannot buy an IV bolus online at all. Check our Top List of Recommended Pharmacies for cheap, safe, and effective sildenafil products. Patient reviews for sildenafil are mixed when it comes to pulmonary hypertension. In general, those who reviewed sildenafil positively have had their quality of life increased, while those who reviewed it negatively found it had little to no effect or caused an adverse reaction. This anonymous reviewer had an adverse reaction to sildenafil, claiming that “My breathing actually worsened over the month I used it”. Speaking with your doctor before starting sildenafil reduces the odds of adverse reactions like this. Always be safe when shopping for prescription medicine online, especially when you’re looking to treat a condition as serious as pulmonary hypertension. Sildenafil is a prescription-only drug in the US, meaning you have to have a prescription written by your doctor before you can buy. Be wary of any sites offering to sell you sildenafil without a prescription. Many of these sites are online scams that will never deliver your product. Others will sell you an inferior or unsafe product; taking these counterfeit pills can be hazardous to your health. Speaking with your doctor before buying can also help you avoid adverse reactions to medicines. To find a reliable supplier of Sildenafil, consult our Catalog of Top-rated vendors. Pulmonary hypertension is a serious condition. Fortunately, many sildenafil citrate products are available to help you. Knowing how to take your sildenafil can help you lead a happier, healthier life.